Arlington County was carved from a section of the District of Columbia and formally named by the Virginia General Assembly in 1920. The rural farming community across the Potomac River was home to vacationing District of Columbia elite as well as rumrunners and brothels. Law enforcement fell to the commonwealth attorneys, sheriffs, special officers, and citizen leagues. 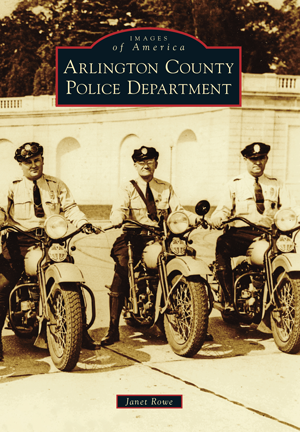 The county board adopted a proposal, and the Arlington County Police Department was founded on February 1, 1940. This photographic history covers law enforcement from the early days of rumrunners to the present day, showing the changes in uniforms, equipment, methods of policing, and the department's response to the 9/11 attack on the Pentagon. Officers are shown training for the line of duty, investigating crimes, serving in specialized units, and promoting public safety. The officers who made the ultimate sacrifice in service to the community are honored here. Janet Rowe served as a patrol officer with the department from February 1981 through June 2012. During her career, she was assigned to the Evening Patrol Section, serving as a field training officer, a certified crisis intervention officer, and a member of the Crisis Negotiation Team. The historic photographs were obtained from the police department archives and from private collections of fellow officers.